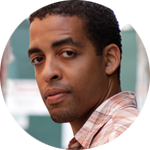 A graduate of Dartmouth College and NYU Graduate Film School, and recipient of the Princess Grace Foundation Award and Spike Lee Fellowship, New York native Rashaad Ernesto Green has been included on Filmmaker Magazine’s elite 25 New Faces of Independent Film list as well as indieWIRE’s Ten Exciting New Voices in Black Cinema. His short films have screened on HBO, BET, at Sundance and won accolades at festivals internationally. He’s been supported by HBO, NBC, Warner Bros, Time Warner, Sundance, Tribeca Film Institute and IFP. Green’s first feature and thesis film Gun Hill Road, starring Esai Morales and Judy Reyes, premiered in the 2011 Sundance Film Festival U.S. Dramatic Competition and opened theatrically in 26 cities nationwide. Most recently, Green wrote a pilot for a spec HBO series and directed episodes of NBC’s Grimm and CW’s Supernatural for Warner Bros TV.